The growth of Salt Lake’s cycling community has been anything but subtle. While bike shops have been ever present and thriving, a certain niche has also presented itself as a growing opportunity for local developers who want to not only welcome and encourage non-cyclists but also inspire regular riders to support local business. 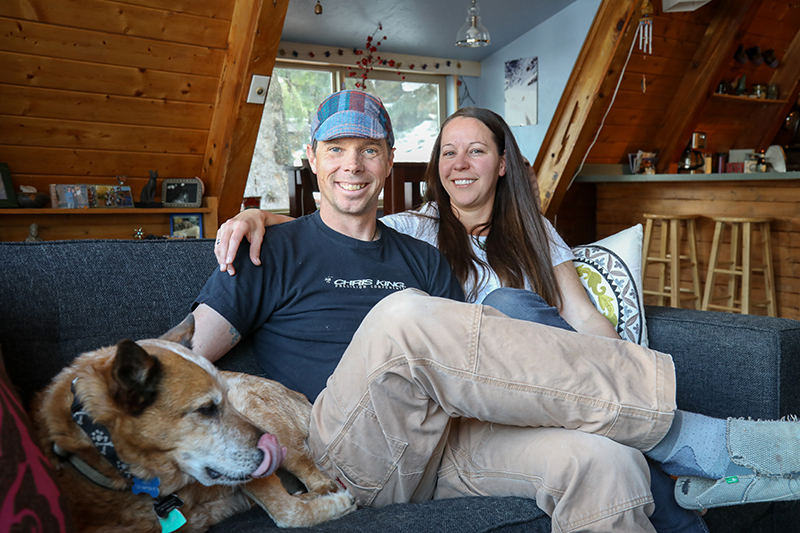 In the case of Josh and Jacquelyn Van Jura, these two concepts have been the driving force behind their company, Broad Fork Bags, which has brought functionality and community to the bikepacking scene in Salt Lake City and Utah. Four years ago, Josh decided to attempt a bike race—with zero training or preparation—which stretched from Canada to Mexico. While his journey was cut short 1,000 miles in due to a pulled Achilles tendon, that first race is what pulled him to the bikepacking community. After his return home, he started looking into everything a bikepacker would need. He soon saw that the lead times for bags was unnecessarily long for his needs, and he already had the necessary skillset, which he learned from his mother at a young age: sewing. “I grew up sewing, something that my mom had taught me, so I figured out what materials were needed and just made one at home,” Josh says. From there, the familiar six-pack-trade-for-work began as he started to share his end product with friends. After leaving work, Josh would go home and work on bags. Once curfews had to be set, like the “No Sewing Past 11 p.m. Rule,” Josh says, “I realized I was no longer able to keep sewing bags for six-packs once friends of friends of friends were wanting bags.” It was then that Josh and Jacquelyn turned to selling their wares professionally. Cyclists all over Utah now proudly use Broad Fork Bags’ products. Jacquelyn notes how she loves being on a trail or just out biking and seeing the company gear on fellow cyclists’ bikes. The company has also provided the opportunity for the couple to become even more engaged in the community, meeting people to go bikepacking with and encouraging others to do the same. That’s what Josh believes is the main purpose of it all: “It’s about riding bikes, at the end of the day,” he says. “It was never meant to be a business—just something to help.” This cornerstone mentality has helped to extend the sense of community beyond even the borders of Utah, from visiting fellow bag-makers out of state to collaborating on orders and sharing design tips among the makers. The lack of competitiveness throughout the scene is something that Josh believes helps drive the idea of supporting local. Other bag makers with longer turnaround times will often refer customers to Broad Fork Bags, which helps create a sense of local support that’s missing from online, out-of-state companies. Beyond bikepacking, Broad Fork’s gear is also accessible to any kind of cyclist. For the commuter, the gear could hold a change of clothes; for the responsible drinker, a bar-pack will perfectly fit a few beers. The material for all of the bags is tear-resistant and waterproof, made from the same fabric used for boat sails. The simple-to-follow instructions for bag templates ensures that every inch of your back fits perfectly to you and your bike. 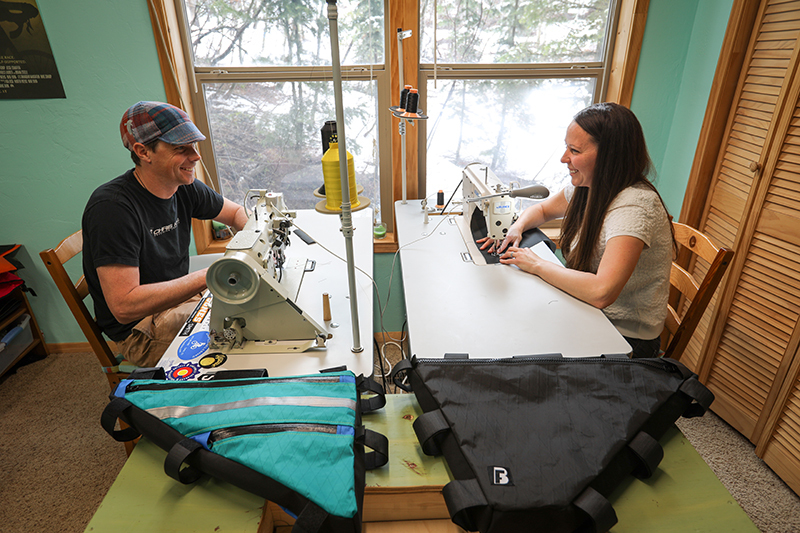 During the three-week lead time, Josh and Jacquelyn clean up the template, cut the materials and get to work sewing and tacking everything together for a handmade, quality and reliable piece of gear. As far as plans for Broad Fork Bags’ future goes, Jacquelyn shares that they want to let it continue to grow organically. “While we take one step at a time, and as long as it’s growing, we want to make sure it’s manageable,” she says. A “good” problem that comes with running a popular business for bike gear is that getting busy can sometimes mean less time spent biking. For Josh and Jacquelyn, the balance between doing what they love—biking—and providing quality service is important to the success of their company. Supporting the community and being accessible and approachable creates the environment that every consumer should crave when choosing local businesses, and Josh and Jacquelyn have mastered it all. From taking a day’s worth of supplies and camping for the night to going long distances and restocking in a new town, Broad Fork Bags’ gear helps to bolster the cycling hobby or lifestyle, allowing the freedom and ease to take a little adventure along for the ride. To order your own custom bike packing bag, visit broadforkbags.com.